Police identify California killer Jump to media player US police confirm that a man who killed six people in a rampage in California was 22-year-old Elliot Rodger. US shooting suspect 'had three guns' Jump to media player The man suspected of killing six people in a drive-by shooting in California had three legally-owned handguns with him, authorities say. Victim's father: 'Not one more' Jump to media player The father of one of six people killed in drive-by shootings in Santa Barbara has blamed "irresponsible, craven politicians" and the NRA for his son's death. Gunman's parents 'contacted police' Jump to media player The man believed to have shot dead six students in California was being treated by mental health professionals, his family's lawyer has said. 'I ran away for my life' Jump to media player Witnesses to the drive-by shootings in the Californian city of Santa Barbara have described seeing a man firing a weapon. California gunman video emerges Jump to media player The son of a Hollywood film director has been identified as the likely gunman who killed six people in a series of drive-by shootings in the US city of Santa Barbara. 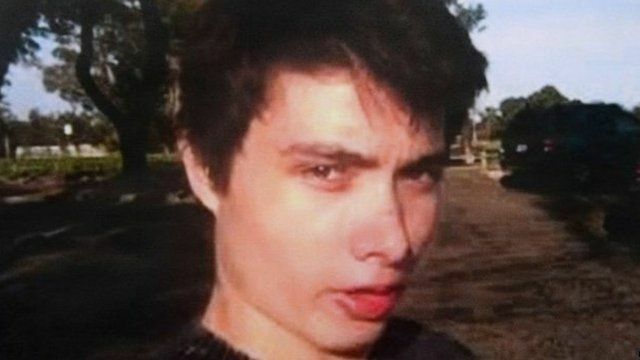 A man who killed six people in a rampage in California was 22-year-old Elliot Rodger - the son of Hollywood filmmaker Peter Rodger, US police have confirmed. At a press conference, police said Elliot Rodger had stabbed three male room-mates to death at his apartment, before going on a rampage through Isla Vista in a black BMW, shooting at people at random. After exchanging gunfire with authorities, Rodger was found dead inside his crashed vehicle with an apparently self-inflicted gunshot wound to the head.